Chardonnay is a really flexible variety, growing almost everywhere it’s planted. And for years it was trendy, with its particular tendency to enjoy the kiss of oak, and become big buttery over ripe monsters. Then the tide turned and suddenly all Chardonnay was tarred as bad, (except Chablis and other white Burgundies, they always escapes by not mentioning grape variety on their labels). But as with all fashions Chardonnay is on the way back up, its getting Cool again, and in more ways than one. In Australia, these days the oak is applied more evenly and more justly, more sensibly but the standout wines are coming from cooler climates such as Adelaide Hills, Eden Valley, Margaret River, Mornington, Orange and even Tasmania. 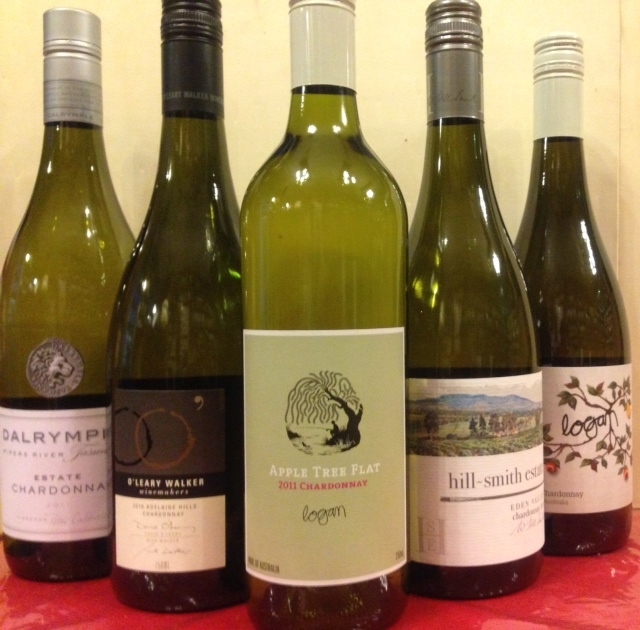 It is making a comeback and making an argument for itself as the queen of Aussie whites. ‘Burgundian-style’ Chardonnays full of verve and energy can be found from many producers. This delightful Chardonnay is packed with aromas of pear and lemon with a nicely structured palate of white peach, cashew and fig before leading into a persistent finish. It’s perfect everyday drinking at an affordable price. This wine displays delicate stone fruit characters of white peach and nectarine, with subtle grapefruit aromas. Fine yet powerful with great fruit weight, intensity of flavours, richness and oak texture. Clean with finely balanced acid. The most Burgundian of the wines listed here. With Peter Logan’s it’s all in the detail. It starts with the wine, premium fruit picked at high altitudes in Orange, meticulously handled by Pete. Putting the cool back into cool climate this Chardonnay is perfumed with orange, pear and a touch of spicy oak. The flavours of peach and grapefruit vie for attention complexed by minerals. Textured and long it would pair brilliantly with rich, seafood dishes. On the nose, smoky wild yeast complexity and subtle notes of struck flint intertwine with aromas of white nectarine, grilled cashews and citrus blossom. Full flavoured and textural on the palate, with creamy white nougat, citrus zest and ripe quince and melon flavours. The richness is held in check by a restrained grapefruit acidity and a savoury finish. A delicate Chablis styled Chardonnay. Brilliant very pale straw colour with slight greenish tinge around the edges and watery hue. The nose displays aromas of melon and spiced lemon and lime peel richness. Light to medium weight the palate exhibits elegant lemon confit with a spicy freshness drives through a clean fresh palate complexed with chalked, crushed stone texture. Finishing with a clean crisp finish.